Quiet and indiscriminatory, the onset of the pancreatic cancer, often referred to as the ‘silent killer’, goes almost undetected – until it’s too late. Scientists say uncovering early detection markers are key to saving lives. Unlike other cancers, there are no real telling signs of when pancreatic cancer hits a person. People often mistake the symptoms of pancreatic cancer as signs of other common illnesses like a flu or food poisoning. These symptoms include loss of appetite and weight loss, nausea or vomiting, tiredness, and pain in the back or abdomen. “Pancreatic cancer is a difficult disease for doctors to diagnose because the symptoms of the disease are so general. Some of these symptoms may be jaundice, weight loss, and abdominal pain — all things that are more likely due to other more common illnesses. This means that by the time a patient receives a diagnosis of pancreatic cancer, the disease is usually at an advanced stage,” said Dr Lorraine Chantrill, medical oncologist of The Kinghorn Cancer Centre and honorary research fellow at Garvan Institute of Medical Research. But researcher Tony Hu and his team of Arizona State University have recently come across a potential technique that could help with the early detection of pancreatic cancer. In conducting a trial study with 59 patients who have been diagnosed with the killer disease, 48 healthy patients, and 48 with a similar disease known as pancreatitis, the test was able to successfully identify a particular protein known as EphA2 through tiny blood samples in 90% of the cases. The trial could possibly serve as an early warning sign of the earliest stages of pancreatic cancer. “Pancreatic cancer is one type of cancer we desperately need an early blood biomarker for,” Hu says. 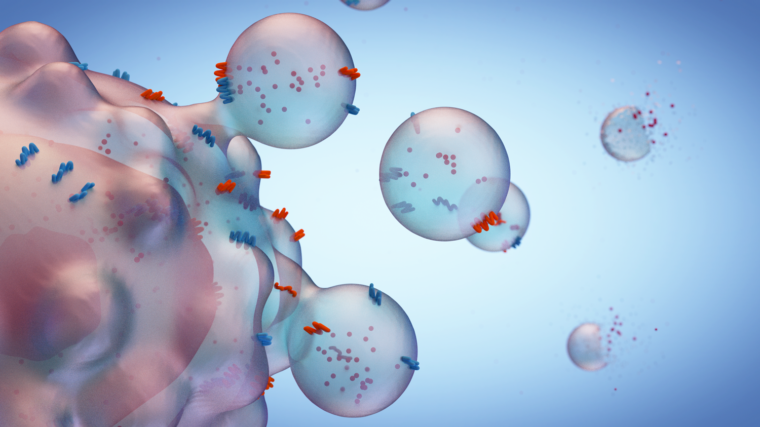 Exosomes are a form of extracellular vesicle (EV) released from most kinds of prokaryotic and eukaryotic cells. Once thought to be mere detritus from cellular metabolism, they are now linked with many critical forms of cell signalling and immune function and play a vital role in a host of diseases, particularly cancer, where they may act to aid metastasis and thwart anti-cancer therapies. While it’s still early days, the discovery gives Vodafone Foundation further motivation to garner ongoing support for pancreatic cancer research carried out by Australian-based Garvan Institute of Medical Research through the DreamLab app, which uses your smartphone’s computing power to solve cancer research problems faster. You can simply plug in your phone at night, open the app, and information on the research puzzles solved is sent back to Garvan researchers via the Amazon cloud – like a giant crossword puzzle, with each app user solving a different part. Garvan is tackling the silent killer of pancreatic cancer online and overnight. Such research is so crucial given pancreatic cancer can affect anyone – male, female, young, old, and even the rich and famous (celebrities include Apple founder Steve Jobs, actor Patrick Swayze, and Italian operatic Luciano Pavarotti to name a few) – and at any time. “Despite continued research efforts, the outcomes for those diagnosed with pancreatic cancer haven’t improved in the last 30 years. It kills 95% of those that it affects within five years, there is no early detection test and few treatment options. So far researchers have been unable to unlock the secret to pancreatic cancer and we must do more,” said Dr Chantrill. Download the DreamLab app now, and help solve cancer while you sleep.